This is part 2 of many! For the most part, this is same content/notes that I had done as part of my SCCM Guru sponsored webcast in early 2012. Thanks everyone for sticking it out with me through the webcast so far! I hope that I haven’t lost too many folk. Now that we’ve reviewed the fundamentals of task sequences – steps, variables, and conditions – lets now get into some scenarios, examples, and demonstrations of what the power of task sequences can do. As mentioned task sequences are not just for deploying an OS. They can be used for automating any tasks such as deployment of varied software, chaining installations, configuring Windows, performing decision logic, etc. Prior to task sequences the only way to link together, or chain, execution of different packages was to use the “Run another program first” option with the advanced settings of the program. In such a way, you could chain multiple packages together to ensure exact execution in a precise order of operations. However, this suffers from some limitations such as if one program failed midway in the chain, the remainder of the chain failed. Furthermore, if the chain was rerun, it then needed to rerun from the very beginning of the chain and repeated those programs which were previously successful. Although it was good for what needed to be accomplished, it still had challenges and limitations. Now with the power of task sequences, chaining programs is almost a thing of the past. In fact task sequences can give you as the administrator so much more control over the end goal. As mentioned, a typical best practice distribution of software is to build collection where the query is designed to only target computers that are missing a particular application version unless the version is newer. For example, Application A is installed corporate-wide at version 1.0. You’ve been tasked with upgrading it to version 1.1 and any computers missing the application. However, some computers are running 1.2 so they should not be included in the target. So you would be your sub-select query to fulfill these requirements. Demo 12: Include an example of the sub-select query so that it translates better into how that looks in a WMI query. Also demonstrate how it could be broken into two different steps of x86 and x64 or combined into one step. Here’s a situation that you’re all familiar with: keeping the desktops and laptops updated with the most secure software within the environment. Though often times, software is deployed on as-needed basis, more and more companies require a change control process coordinated with a specific period in which the updates can be deployed to computers. At its most simplistic form, an admin could just assign a package to a collection with the assumption and hope that all computers installed the updates. A better step in the right direction is to create a collection with a sub-select query to only target the computers that actually need the software. However, what does one do if you want the best of both worlds? Turn to the power of task sequences of course! This is a great example if you’re in a situation where all actions need to run in a systematic timeline with very little lag and better visual indicator to users. 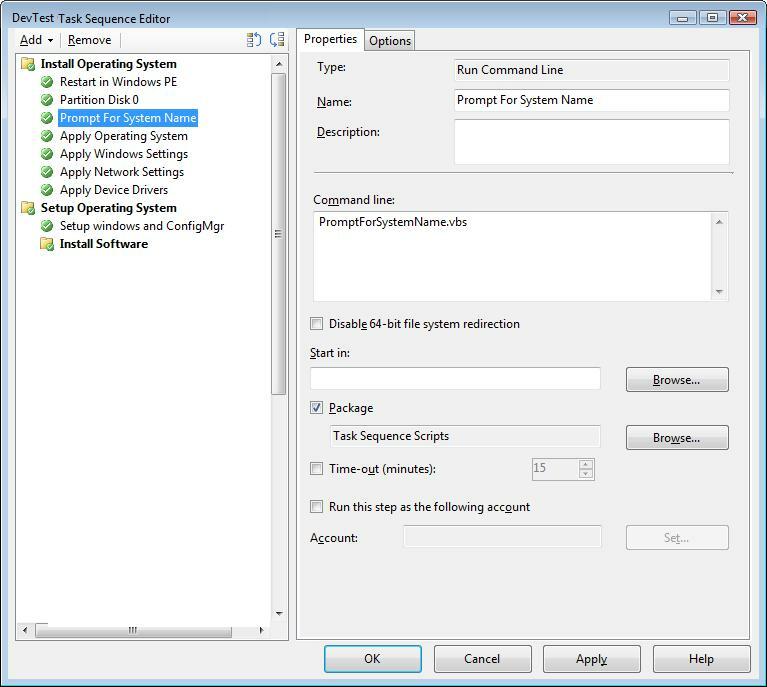 Change the default restart time from 30 seconds to 10 minutes so users have enough time to close documents if necessary. Now let’s pretend you have a string of routine administrative tasks to perform against computers on a regular basis. Task sequences are also powerful in this way by not just being limited to installing software or deploying an OS. The example that I’ll use here may not completely be a real world example, but again, it is designed to demonstrate flexibility and get your juices flowing. I am going to have more fun with the flexibility of task sequences by demonstrating six different ways to accomplish the same thing. In this example, we are going to uninstall Flash v10 and install Adobe Flash v11 either with the 32-bit or 64-bit editions. Keep in mind that some of these exmamples are a little unrealistic, but it does exhibit the flexibility. Here is a cool thing that I’ve done in my experience. There had been a few instances where one of the field offices was being sold to another company, but it was contracted for the new ownership to retain the existing computer hardware. The challenge therein was that we couldn’t allow them to have access to company software licenses or data that may exist on the system. So I developed a task sequence to remotely erase the hard drive. hello, that look interesting, do you have any tricks to prevent the user logging in the computer while the task sequence is running? I know that during an OS deployment when it’s installing software it’s not in the WinPe environment and the user can’t do anything but i’m unable to reproduce this behaviour when running a non OSD TS. Great post by the way, thanks!